So this is how good things happen organically at Grand Canyon University. When a huge storm dumped nearly three inches of rain on west Phoenix in about 1½ hours Aug. 2, the GCU campus was flooded along with the area around it. That area includes Grand Canyon University Championship Golf Course. 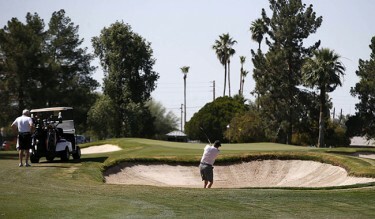 That much rain in that short a time is especially bad for sand traps on a golf course, and Jesse Mueller, the course’s director of golf, discovered that he had a challenge that would overwhelm his maintenance crew: The sand in all of the estimated 75 bunkers on the course had shifted, and they all would need substantial raking. So Mueller did what comes naturally at GCU: He looked for volunteers. He reached out to Greg Harman, the University’s executive director of academic alliances, and Jeff Glosser, director of academic alliances, to see if they could round up some Canyon Christian Schools Consortium students who could help. Harman and Glosser did him one better. Actually, they did him about 12 better. Not only did six students arrive at the course at 6 a.m. over the course of four mornings (including two weekend days) to help, a half-dozen employees also volunteered. And leading the way, rakes in hand, were Harman and Glosser. “Just playing in the sand,” Glosser said, laughing. Mueller said he didn’t know what he would have done if he hadn’t gotten such a big assist. “It’s great that there are so many nice people here, both students and employees, who are willing to volunteer their time,” he said. Mueller hopes he doesn’t need to call on them again — another big storm was heading toward Phoenix on Tuesday after blasting the Tucson area. But at least he knows where to call for help.